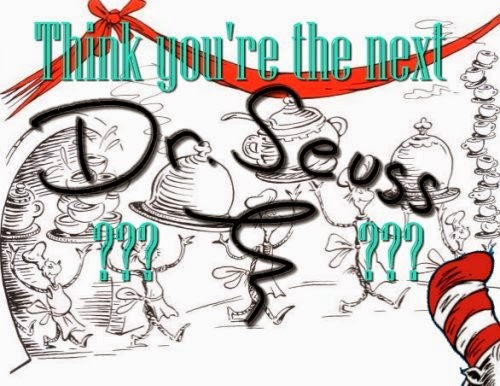 Are you the next Dr. Seuss? 4 "Doctor's Orders" to write rhyming books kids will love to shreds. Thinking of writing in rhyme? No wonder. Thousands of new rhyming kids' books come out every year, and lots of them are snapped up eagerly by parents and teachers. A great rhyming book can help a reluctant reader, lull a child almost to sleep, or turn storytime into a bouncy fun lap experience for parent and kid. But the best books, the ones kids carry around until they're loved to tatters, pages hanging out, covers falling off - not from abuse but from sheer love - those are the books you probably hope to write someday. The great news is that you really can, with these four "Doctor's Orders," borrowed from the grand master of rhyme, Dr. Seuss (aka Theodore Geisel). Doctor's Order #1. Give them a name that's not quite the same. Even though "Sam" is a pretty typical name, "Sam-I-am" certainly isn't. 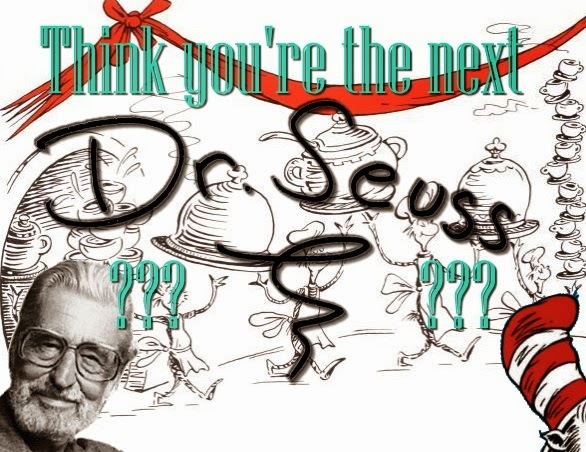 In general, Dr. Seuss picked strange and memorable names for his characters. Often, these were names that would fit in with the story's rhyme scheme. He also kept them pretty short. Dr. Seuss rarely went over two syllables with his names. Yertle the Turtle; the Cat in the Hat; Horton; Sam-I-am; the Lorax; the Grinch. One exception is Bartholomew Cubbins, but his books didn't rhyme. Quick Tip from Seuss: Pick names that will be easy to rhyme. "Alexander" isn't great, but "Rosie" or "Miles" offer more possibilities. 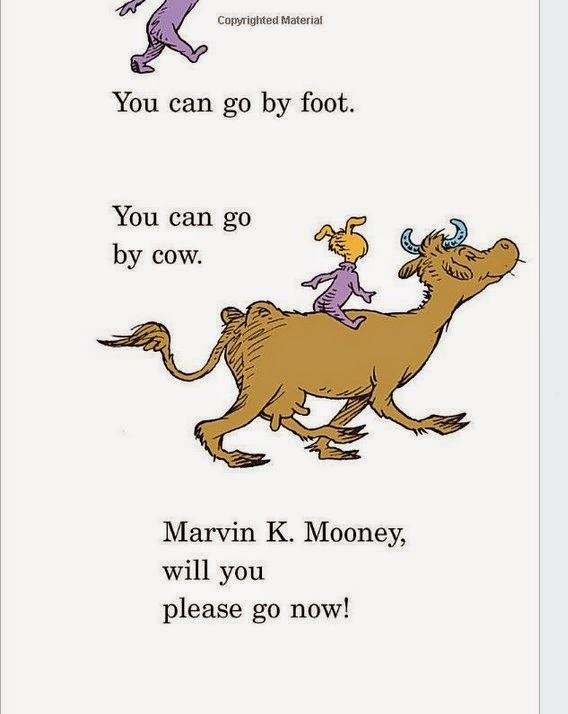 This is optional - you can always avoid sticking your character's name at the end of the line (as Dr. Seuss did with Marvin K. Mooney, will you please go now!). But it's nice to have the choice and not back yourself into a corner. Doctor's Order #2. Some stories are worse if they're told in verse. Even Dr. Seuss couldn't rhyme all the time, even if he had wanted to, which he probably didn't. Rhyme is great, but it's a very limiting form. The Lorax and The Butter Battle Book rhyme; Bartholomew Cubbins and the Oobleck doesn't. This can be a slightly mystical decision. After I wrote my last post about rhyming children's books, I heard from lots of writers who said that whether or not a story would be told in rhyme sort of "came to them," along with the story itself. Sometimes, the first lines formed in their head already in rhyme, like the story was telling them that it wanted to rhyme. I totally respect that; you can't force a rhyme on a story that's meant to be told in prose, and vice versa. That doesn't mean you have to sacrifice great, poetic language, by the way. Even if you decide against rhyming your story, you can still play around with sounds and create lots of fascinating near rhymes... as long as it's clear that that's your intention. Quick Tip from Seuss: Can you imagine the beginning of the story in rhyme? It's not always smooth sailing all the way through, but the first few verses should flow pretty easily... or else maybe your story is trying to tell you something. Doctor's Order #3. Make sure you've got a rhyme-worthy plot. I know how easy it is to get carried away when you're rhyming. You lay out your words, it all sounds fantastic... so now you're done! But if it's going to be a standalone kids' book, you must check to make sure that what you've written is actually a story. If not, don't be discouraged. 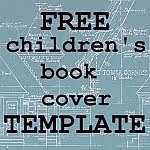 You may find you're creating a book of kids' poems instead (a topic for a totally different post). You may feel tempted to create a grand Homerian epic. Don't. Green Eggs & Ham: 1) Guy doesn't want to eat green eggs and ham. 2) Sam chases him; he refuses. Sam persists to the point of disaster. 3) He relents, and discovers he actually loves them after all. The Cat in the Hat: 1) Kids are bored at home on a rainy day. 2) Cat arrives and entertains them... to the point of disaster. 3) Cat tidies up, just in the nick of time before Mom gets home. 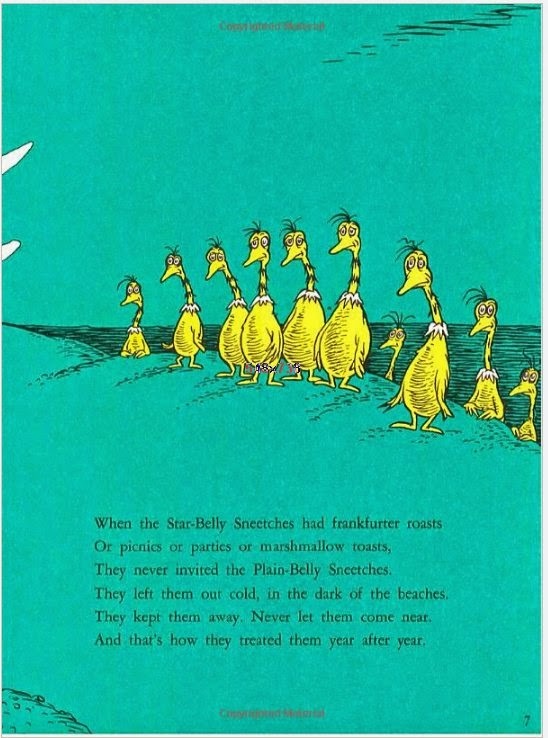 The Sneetches: 1) Some of the Sneetches are unhappy with the lack of stars on their bellies. 2) Man arrives with machines to solve all their problems, making them miserable... to the point of financial disaster. 3) The Sneetches (sort of) learn to be happy the way they're made. Quick tip from Seuss: Dr. Seuss actually wrote a few books that rhyme but don't actually contain a story. Fox in Socks and One Fish Two Fish are two that come to mind. I'm going to warn you, though: Dr. Seuss was a known and recognized genius when those books were written. Yours, if they are similarly plotless, may not be so well received. Doctor's Order #4. Make sure you rhyme - ALL of the time. I've left the most important feature of your rhyming kids' story till the very end, because it's easily the most important. I've written about bad children's rhyme before, but apparently, not everybody has read that post. You can, and you should. 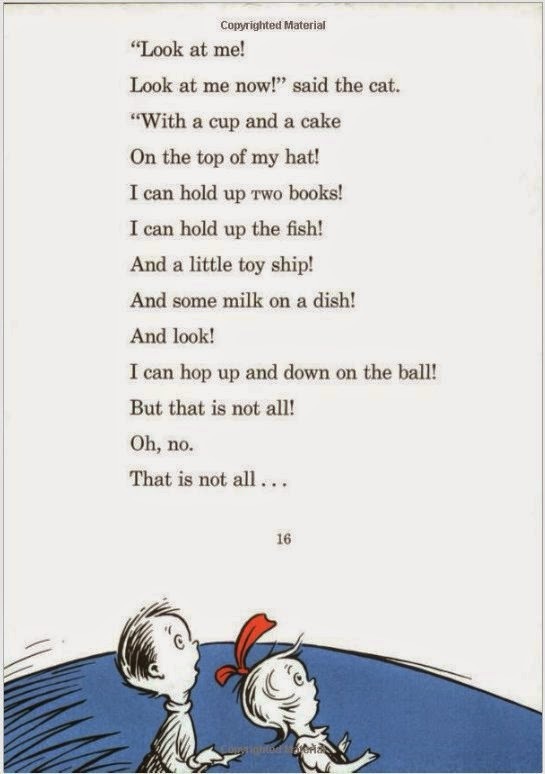 When it comes to Dr. Seuss, though, this is one area where he was a total rule-breaker, usually to great effect (though I have come across some cheesy groaners in his books, too; it's nice to know even the master isn't perfect!). Here are some basic rules you should follow... even if Dr. Seuss didn't. Words do not and cannot rhyme with themselves. The real Dr. Seuss abused this to great effect in several books, including How the Grinch Stole Christmas. But that doesn't mean you can. Don't make up words for the sake of your rhymes. Dr. Seuss did this plenty. You can't. Maybe, just maybe, if you are an absolute genius, you can get away with it ONCE. But it's better not to try. When he does it, as he does here in The Lorax, it's brilliance; when I do it, it's usually just sad. Don't abbreviate words in unnatural ways. Unless your native tongue is middle English, don't even try to use words like "e'en" or "o'er." Yeah, Dr. Seuss did it sometimes and it's cute (here, in Yertle the Turtle, Yertle says "I want 'bout two hundred! "), sometimes. I can't get away with that, and neither can you. 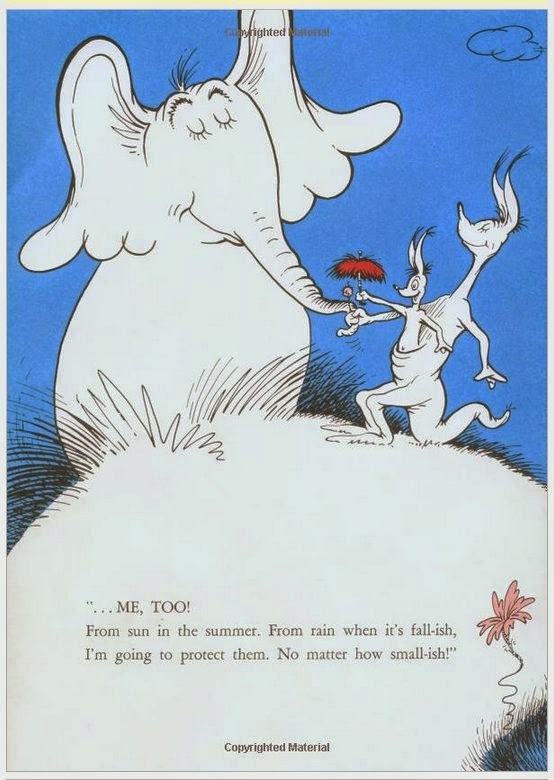 Here are two great big YESes, where we can emulate Dr. Seuss to great effect in our own work. Don't be afraid to repeat yourself. Like a song, your book is a poem, and that means you're allowed to create a refrain, as long as you don't use it over and over to the point where it becomes tedious or predictable. And don't be afraid to play with the refrain, as he does at the end of Horton Hears a Who, messing with the familiar "a person's a person, no matter how small" to very cute effect. Not every line has to rhyme with the line before or after. AABB is the simplest form of doggerel, which is pleasing in small doses, but over the course of an entire book can create monotony. Look how wonderfully varied this page is, from The Cat in the Hat. I love this page because the meter is just a little bit crazed... sort of like the cat himself. When I graduated from university, my first husband bought me two gifts. The first was a beautiful wooden frame for my diploma, which I liked very much. The second was a boxed set of Dr. Seuss classics, clothbound in old-fashioned primary colours, titles golden-embossed on each cover... which I absolutely adored. That set is still around, many years later, but those beautiful books aren't in great condition anymore. Despite love and care, some are smushed and tattered, others are missing and have had their place taken by less priceless replacements. And the thing is, I don't mind at all. Because it means I couldn't keep my kids away from those books. It means they have loved those books as much as I do. That's why Dr. Seuss is the master, and why the rest of us all have so much to learn. But the lessons aren't impossible, and the possibilities are endless - and exciting. Let's go out there and write great kids' stories that rhyme... stories so great that someday, kids will love them to shreds. This helps with my "Buster the Noodlehead Dog" books. "He's small, black, and white; but not very bright"! Thank you Jennifer for sharing these great tips. I just published my first rhyming story so it's too late to make sure I followed all the suggestions. But I have many rhyming stories that I'm going to check to make sure they follow the rules before I publish. Super advise! Both of my books, Eco in the Garden and Barefoot Nylah, are in rhyme. My upcoming due before Christmas, Bobby's Purple Shoes, is rhyme, as well. However, after those 3 books, I do believe I am going to venture off to a couple new books I have in the "works" and neither of them are in rhyme form. I hope by expanding my own horizons I can keep my creativity fresh... which will, in turn, keep my books fresh, too! Love your blog! Thanks! Write better, sell more books. Under a buck. Dear Amazon, what’s up with my Kindle prices?